Properly known as the Enlightened Republic of Greater Orm and the Upper and Lower Paan, this nation is possessed of tremendous wealth, marvels of engineering, a fearsome military and a bloody history. The city of Orm itself, the capital of the republic, is the most populous city in the world. Divided in two by the wide, sluggish Paan river, Orm is on one side a dusty, noisy, dizzying hive of countless tens of thousands living literally atop one another in labyrinths of mudbrick. It is here that the avaricious Lifebrokers first practised their healing and funereal arts for the masses, and it is here that Citadel’s global banking and lending institution, the Usurer’s Guild, first opened its doors. On the other side it is a well maintained civic district, also known as the City of the Deadfolk as it is from here that the Viresashi rule - wealthy and influential citizens who have had themselves ceremonially disembowelled and mystically embalmed to achieve positions of immortal power. Up until 115 years ago, Orm was ruled over by the Immortal God-King, Ormasht. He had ruled the city and its territories for over a century and a half, building Orm from a small desert settlement to most technologically and socially advanced city-state in Citadel, the centre of an enormous fertile kingdom covering the entire Paan Delta. Sanitation, irrigation, street lighting and public education were part of life in Orm long before even the Auldport rebellion. However, not all were convinced of Ormasht’s divinity, or even his fitness as a leader. Towards the end, Ormasht had become manic and reclusive and had lost the faith of many. He was deposed in a bloody uprising, and a new state was formed, outlawing religion altogether. This newly formed Republic has been in place for over a century now, and continues to reap the benefits of the society built by Ormasht. The lifebrokers of Orm can grant immortality for a price. Despite what they will tell you, this is not always a good thing. Orm is now the most productive food supplier in all of Citadel, and its manufacturing capabilities are rivalled only by the Empire of Auldport and its mechanomantic innovations. This partly thanks to the high standards of free public education, which give Orm the largest skilled workforce in the world. It is also partly due to practically unlimited slave labour in the form of the embalmed undead “drudge” workers - people who voluntarily enter into contracts as indentured servants after death in order to pay debts they were unable to cover in life. At the heart of the Bright Sea archipelago, in the exotic lagoon-city of Atavia, reside the three Pirate Kings of legend. Known also as the Dead-Eye Three, Saint Sadjan, Queen Demika and Commander Blaine are lords over the most defiant of nations - The Dead-Eye Free State. After defeating the legendary madman Markholm Strack, scourge of the northern seas, the Dead-Eye Three took from him the artifact which made him nearly invicible - The Book of Unnumbered Curses. Under the guidance and watchful eye of the mysterious Patron of Atavia, they divided the book into three and declared an uneasy truce. Even divided, the Book granted incredible powers to those who would unravel its secrets to become one of the so-called Accursed - People who take upon themselves terrible curses in exchange for unthinkable power. This alliance would not have lasted, however, were it not for the devastating natural disaster known as the Sundertide and the emergence of the hostile Abalone Kingdom from beneath the waves. The reefsfolk hordes of the Kingdom, clawing out of their terrible coral fortresses, wreaked havoc upon the Bright Sea and decimated the Dead-Eye fleets. To this day, the reefsfolk prove a constant and tireless threat across the northern seas. Finally reconciling their differences, the Three forged the alliance anew, creating a Free State with its own coin, flag and an established Pirate’s Code for resolving disputes. Though constantly at conflict with various of the world’s navies, the Dead-Eye Pirates are powerful enough to call themselves a nation in their own right and are too mighty for even the Auldport Navy to confront alone. The hundreds of clans of the Urbacha Urugh engage in a yearly cycle of migration around the Four Deserts, just as their nomadic ancestors did as far back as the Rain of Stars and likely before. These People (”Amadi”) of the Urugh have developed an intricate system of interweaving routes as they plot their course around the deserts. This migration cycle is known as the Great Jadaar. Therefore, “Amadi Ul-Jadaar” literally translates to “People of the Migration”. In ancient times, after the deadly Rains had subsided, the Amadi were a disparate people. They warred over migration routes and oasis havens in a constant struggle for advantage. Then came the shadow from the East, devouring all in its path. Entire settlements disappeared overnight without fire or battle. Travellers spoke in haunted tones of the walking dead and demons who wore the flayed skins of fallen Amadi. The terrible Ghul had emerged from Sayaghar, creatures of shadow and filth, to possess the minds and bodies of the unwary. On the other side of the Urugh, a simple herder called Azad became lost in a sandstorm and stumbled deep into the Uzrek Urugh, the blue desert whose province is Sacred Madness. Emerging from the storm, he beheld an unbelievable sight - the suspended grandeur of the Unfalling Temple, and four blazing, brass-clad Ifrit spirits who called him forth to parley. After forty days without food or water, and forty nights of being filled like an empty vessel of clay with the secrets of the Ifrit, an accord was reached. This lead not only to the establishment of the first order of the Dervishes, but also to numerous other understandings between mortals and the etheric realms inhabited by the Ifrit, the Ghul and other, much stranger beings. When Azad returned to the Amadi tribes, he did so as a prophet. He instituted a fair and equitable system of migration which provided fresh front-line troops against the Ghul on a monthly basis - the Jadaar as it is known today. He was also the first of the Dune Saints. The Saints are charismatic leaders empowered with the will of various jinn, and are today the most powerful voices in Amadi society. With their fervent followers gathered around them, it is they who lead the constant battle against the horrors of the Ghul and the black desert. At first breathtaking sight, the city of Endesmouth appears to be a mirage. From a barren valley and rock escarpment rises a magnificent city of elegant white pillars, sparkling fountains and terraced hanging gardens. Among the most sophisticated and wealthy people in Citadel, the citizens of Endesmouth pride themselves on living in a Utopia born of wealth and plenty. Originally a mining settlement of Auldport, the town of Endesmouth is located in the heart of the mineral-rich region of Xeromarea. The town quickly flourished due to plentiful raw materials and the life-giving mineral springs. It is these mineral springs, and the unique taint of blue crystal salt they carry, which has lead to the rise of a new race - the Saltfolk. Infused with the power of the blue-star, Saltfolk display a wild variety of racial traits, leading some to call them a mutation rather than a race in their own right. Not long into the settlement’s history, the presiding merchant house of Marin realized what a treasure trove they were sitting on. Taking advantage of the favourable political climate and a timely mineral shortage in the capital, they swiftly seceded from the Founder’s Council of Auldport and established their own nation. 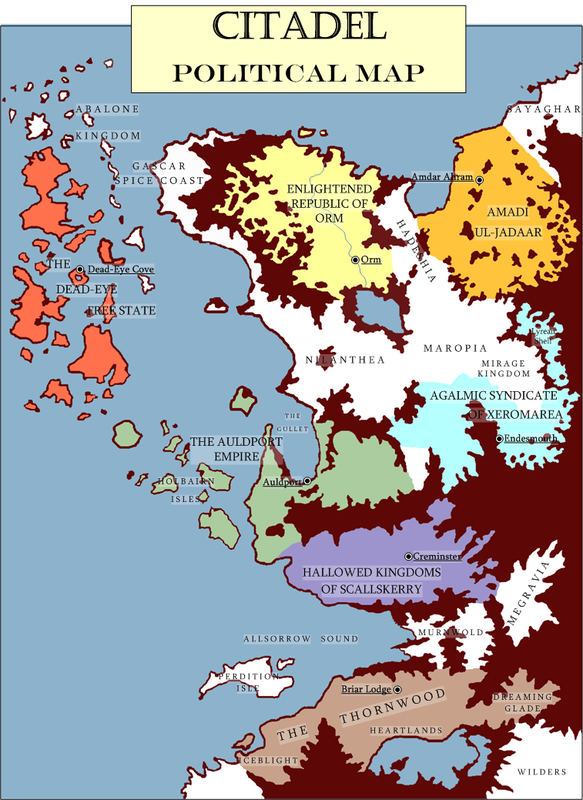 They named it the Agalmic Syndicate of Xeromarea, but it is better known around the world as simply the Syndicate. Since then, the nation has by leaps and bounds, pressed home its advantages - economic, technological and mystical alike. In trade, the Syndicate maintains a stranglehold on refined blue-crystal salts and whole blue stars, as well as several other crucial mineral resources. They are credited as the originators of the Invoker tradition, a pseudo-scientific discipline which summons and binds jinn-spirits. The Seers, a uniquely Syndicate phenomenon, are rumoured to be able to manipulate space and time itself. It is they who guide and lead the Syndicate’s military forces, attacking with highly-trained squadrons of gliders and ornithopters from the terrifying lodestone-powered juggernauts known as the Flying Towers. Join us next week when we’ll have a look at the mysterious and powerful crystals known as the Stars, their history and their potent properties.